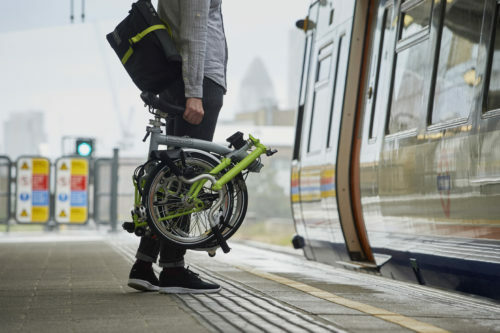 Why should you consider owning a Brompton folding bike? 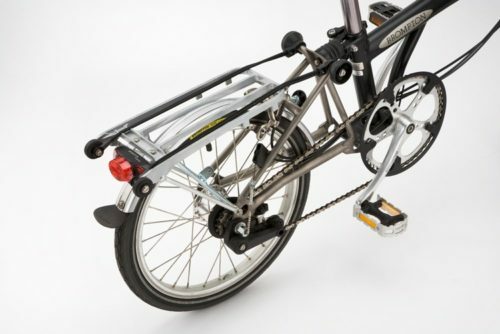 The ingenious design makes the bike easy to fold or unfold in under 20 seconds. When folded the bike is locked together in a compact package, which can be carried or towed easily and conveniently stored almost anywhere. 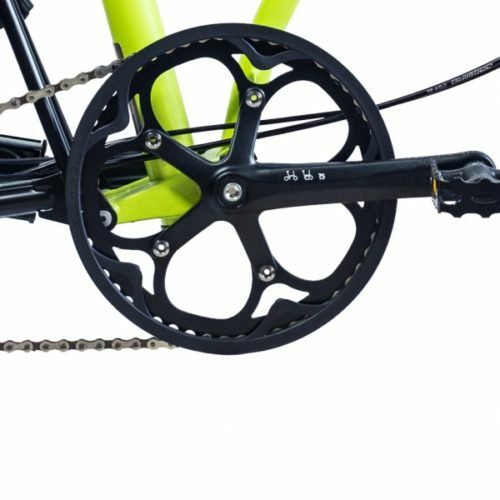 The chain and gears are in the center of the folded package keeping your pant legs and clothes grime-free. It’s the ideal bike for daily commuting, travel, or city living. The small 16” wheels on the Brompton offer superior acceleration. They also lose less speed due to wind resistance. When fitted with high pressure tires, the actual rolling resistance is similar to that of large wheels. The smaller you are, the less the wind will slow you down! When you’re riding in an urban setting, for example, and need to stop frequently, you will appreciate fast acceleration. Because smaller wheels weigh less, they create a lower moment of inertia. As a result, they get up to speed quicker and climb better. Brompton-sized wheels also create a more maneuverable bike. They have more responsive steering and give more tire compliance with the road surface because of their compact size, due to higher pressure per square inch on the ground. This superior maneuverability is especially helpful in tight turns and also on wet surfaces. The more responsive steering may take some getting used to at first, but then it becomes fun to ride. Offering four different handlebar styles, you’ll be sure to find a bike that fits you comfortably. 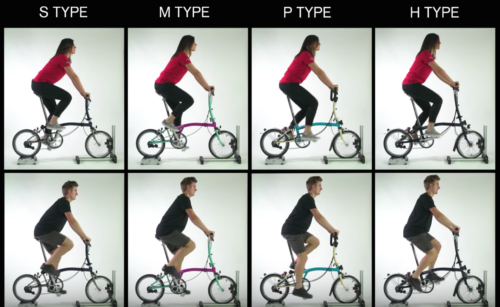 The handlebar types offer different ride positions for various styles of riding, from the casual cyclist to the high-speed racer. The handlebar options mean that the bike will give a superb, comfortable riding position no matter your body type and riding style. M-Bar: the classic Brompton handlebar shape, a good all-around position for riders of various heights. H-Bar: the same M-type “U” shape, but a bit more height. Ideal for taller people or those who prefer a more upright riding position. S-Bar: the shortest handlebar offers a sportier, bent over riding position along with a flat “T” shaped bar. P-Bar: offers the flexibility of several different grip positions. Great for extended rides or bike touring. Although the Brompton is available in 1, 2, and 3 speeds, we’ve found the bike to be the most useful with the 6 speed option and with reduced -12% gearing. A 6 speed adds a mere few ounces to the weight of the bike. The 6 speed really gives the Brompton more capability, and enough gear range for any situation. Because the Brompton is so easily portable, you’ll find yourself taking it with you more, and you’ll want to be able to handle any type of terrain! Also, the -12% gearing is the most useful range for any situation. The low gears will allow you to climb a 10%-12% slope with no problem. And in high gear, you’ll be moving at 25-27 mph, perfect for a fitness ride. E Version: on these bikes there are neither fenders nor a rack. The E version is not only the cheapest option it is also the lightest, fastest, and cleanest looking. On the other hand, the E bike is less stable when folded, and doesn’t come with an air pump. People usually choose the E type for its slick look, lower price, and weight savings. L Version: these Bromptons have fenders with mudguards, which is definitely worth the bit of extra weight. Fenders are a practical option because you never know what you’ll have to ride through, whether it be mud or puddles. A great choice to stay clean and dry. R Version: the full package including a rear rack and fenders/mudguards. The rear rack provides an extra storage platform should you need it, and it also makes the bike the most stable when folded. In fact, you are able to push and pull your Brompton without even picking it up when you have the rear rack. There are other options to consider for your personal preferences when choosing your Brompton. 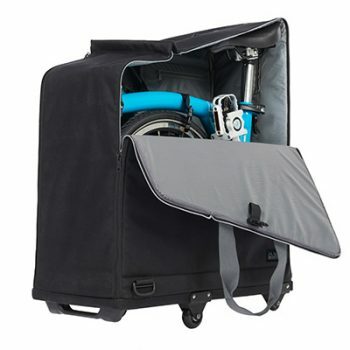 A front carrier block is necessary to carry any of the Brompton front luggage bags. A new lighting system is available to add to any bike, the Cateye USB rechargeable headlight along with the saddle mounted Cateye Rapid Mini tail light. The best part about the Brompton is that it’s totally customizable. We can change any Brompton in our shop to an E, L, or R version. We can add lighting, install different tires, custom pedals, or a Brooks saddle. We can adjust your gearing range or install a taller seatpost. The possibilities are nearly endless! 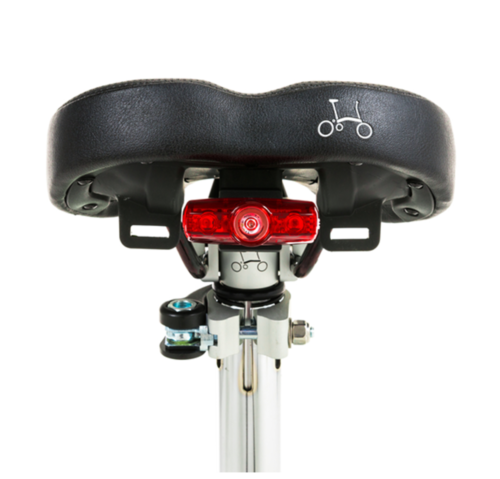 The Brompton can be customized to suit any specific needs or requirement. Just give us a call and ask!